While looking for somewhere new to meet up with a couple of friends for dinner, my wife found G Pub and suggested we try it. The four of us met at the restaurant, eager to try something new in Providence. 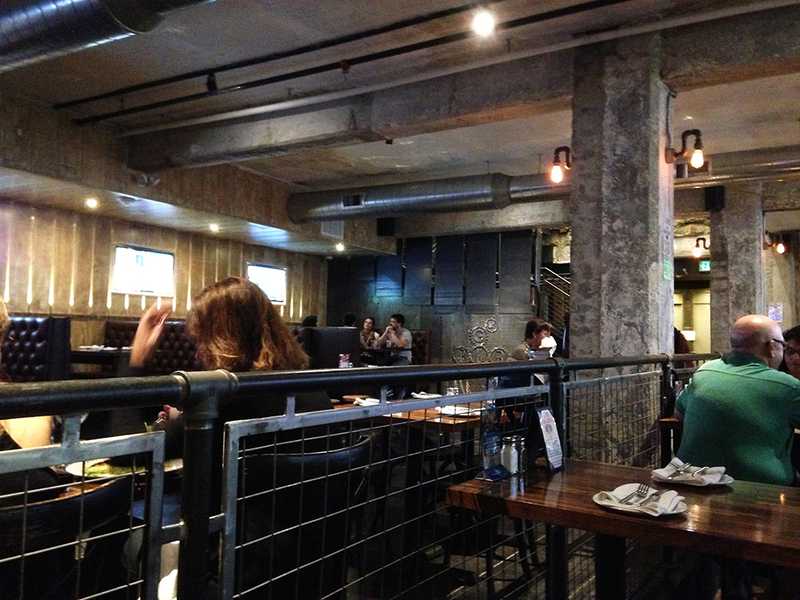 We had a great time hanging out, but the atmosphere and food at G Pub also didn’t disappoint. 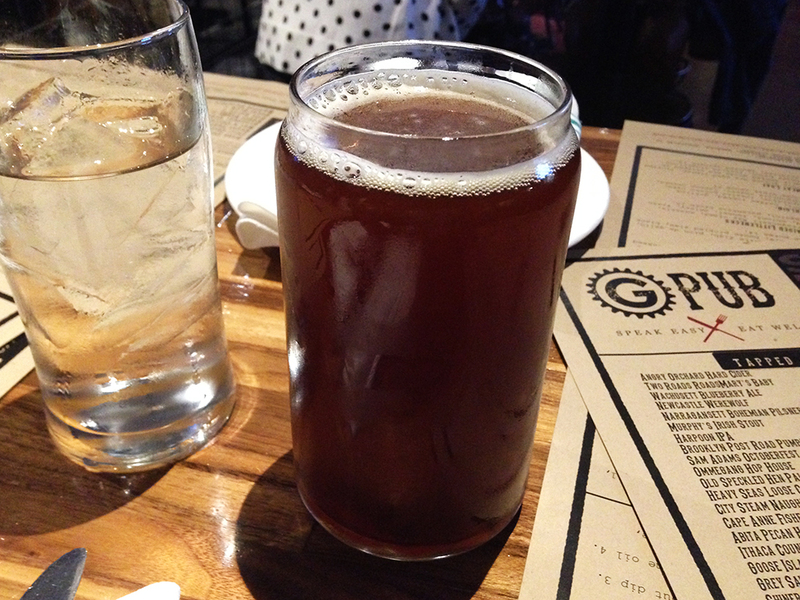 It’s not hard to find G Pub and they even offer free valet parking, which is always a huge plus in my book. The entrance is brightly lit and leads you down some stairs to the main bar or dining area. The decor is a modern design of the basement of the old Providence Gas Building. The result is an industrial, yet comfortable atmosphere that blends classic pub elements like flat-screen televisions and a few classier elements like stylish glassware. I’ve read a few negative reviews about the service at G Pub, but I didn’t have that experience. Our server was pretty fantastic, helpful, and had a good sense of humor. Once glance at the menu and it’s obvious why the word, “pub” is in the name of the restaurant. The food is typical American pub fare, however, a quick read of the descriptions following such common fare as nachos and corndogs reveals that there’s more to the menu than meets the eye. Every dish has a slightly more upscale spin on it, which accounts for why G Pub is a gastropub. Beer – Considering that I was not only in a pub, but it was also the fall, I had my taste buds set on trying a pumpkin beer that I’d never had before. There were two on the menu and when I asked our server, which she would recommend, she said, “Neither.” Confused, I looked at her with a look that did not evoke much intelligence and she nicely explained that the best pumpkin beer on the menu wasn’t labeled as a pumpkin beer at all. She then pointed me towards the Two Roads RoseMary’s Baby (say that three times fast). Taking her advice, I ordered the beer and a wonderful, slightly dark, high ABV, pumpkin beer in a beer-can-shaped glass, made it’s way into my hands. A great start to the evening. 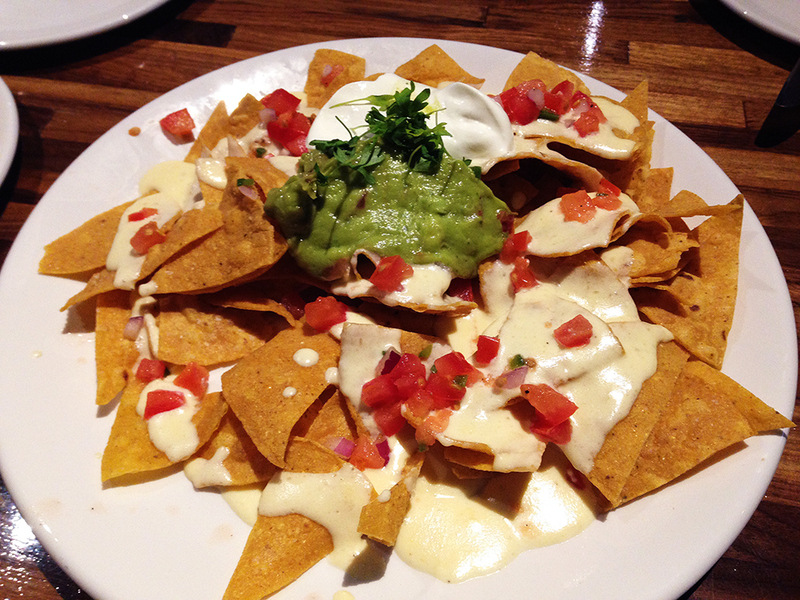 Nachos – After debating appetizers ranging from homemade beef jerky to calamari to roasted nuts, our table settled on ordering a round of nachos to start. The nachos were pretty standard as far as nachos go because we didn’t opt for the additional pulled pork or duck confit toppings. Decent nacho chips, cheddar mornay white cheese sauce, guacamole, and pico de gallo made for a solid, if not especially creative start to our meal. Soft Baked Pretzels – As an additional appetizer, we ordered two plates of soft baked pretzels (they come in orders of two). Even though they had the texture of a buttery pastry more than a typical pretzel, they were absolutely delicious. 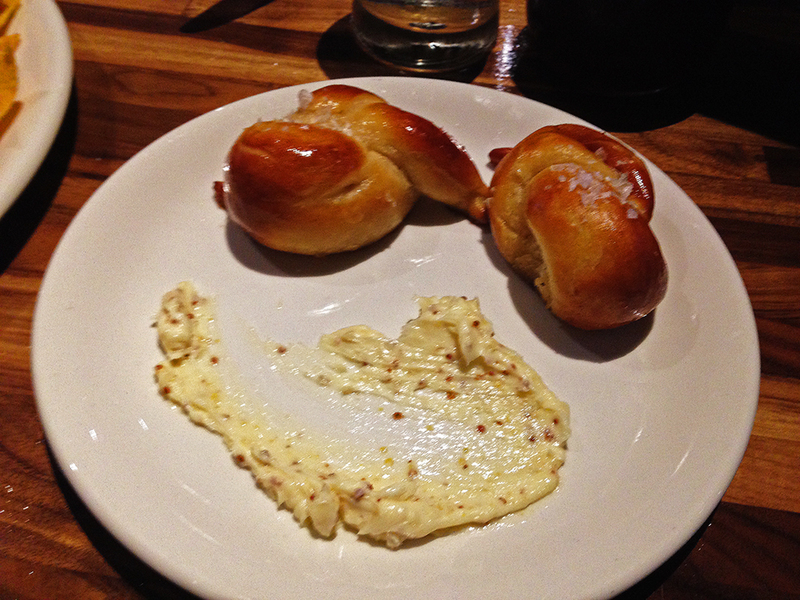 The whole grain mustard butter was the perfect accompaniment to the pretzels. I would support your decision to give these bad boys a try. Apologies for the slightly blurry picture, but we were so eager to try them, that the camera focus wasn’t a priority! 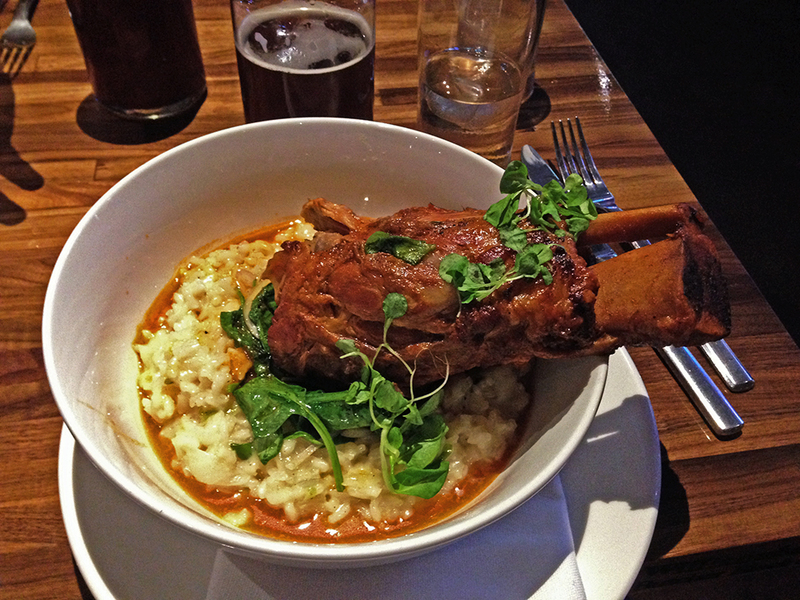 Braised Pork Shank – As my entree, I went big with the pork shank. When I say, “went big,” that isn’t just a turn of phrase either, because this dish was huge. The pork was fall of the bone tender and very flavorful. I was very surprised to find such a perfectly cooked dish on the menu. Luckily, I took our server’s advice when she recommended it to me. The pork sat perched atop a bed of Vermont sharp cheddar risotto that I thoroughly enjoyed. The risotto was a bit like mac and cheese, but with rice instead of pasta. Truth be told, I couldn’t finish the risotto even if I wanted to, which I most definitely did. If you’re hungry, get this dish. If you’re not that hungry, get this dish and take the rest home. We really enjoyed our time at G Pub. The food was typical pub comfort food, but prepared with an upscale touch. Everything we had ranged from good to really excellent, so it’s hard to go wrong with whatever you get. Make sure to ask your server for some recommendations as well. 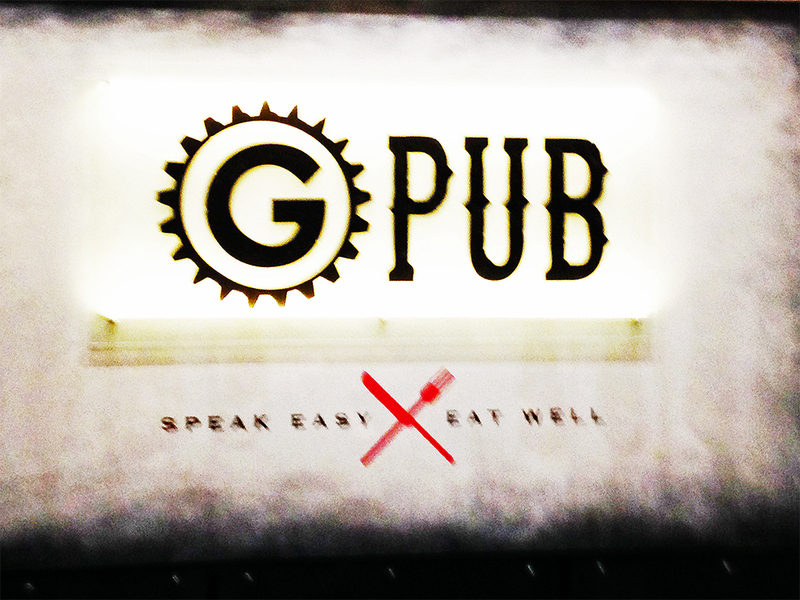 I would recommend G Pub as a casual night out for a deliciously filling, yet good quality, American pub-style meal.